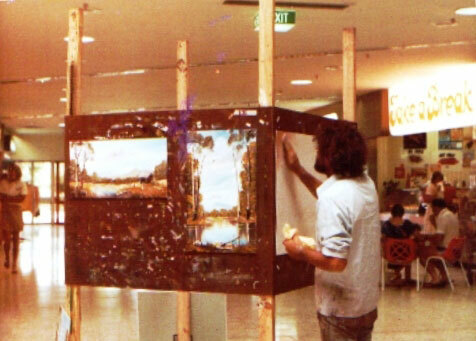 Len Hend travelled Australia from the 1970s, displaying his unique painting style and selling his work and videos showing the wet on wet, loose painting techniques. Len also spends a lot of time in Chaing Mai, Thailand, where he enjoys making tutorial videos demonstrating his original painting techniques – Len is happy to supply lessons to anybody who wishes to learn to paint landscapes – the free lessons are now being watched in countries all over the world and feedback shows how many people who would not be able to access or afford painting tuition are learning from these down to earth videos. The relaxing lessons are also used in institutions such as mental health hospitals and prisons. Most of Len’s lessons are available on DVD and if you need a lesson and can not find it on DVD then contact Len and he might be able to supply it to you.